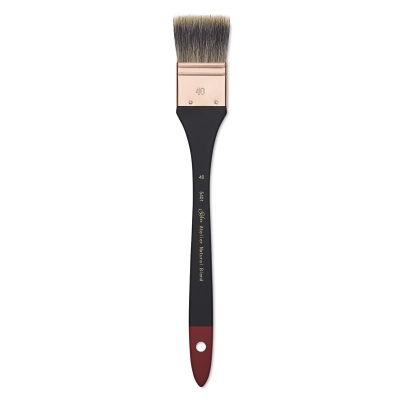 Silver Brush Atelier Badger Blend Flat Mottler Brushes feature a blend of badger and synthetic bristles that is perfect for blending or softening edges in oil, acrylic, and watercolor paintings. Extra-long handles extend the artist's reach on large canvases. Rustproof copper ferrules. The Silver Brush Atelier Badger Blend Flat Mottler Brushes feature a blend of Badger and synthetic bristles that is perfect for blending or softening edges in oil, acrylic, and watercolor paintings. These versatile brushes can also be used to fill in backgrounds and create watercolor washes.